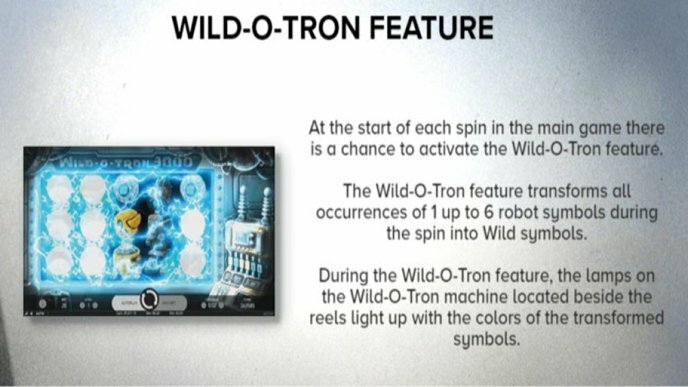 Wild-O-Tron 3000 slot is a new game from Netent that really wants to stand out. You’d probably expect it to do this by offering lots of features or some really unique gameplay or design. But no, the slot as a whole is pretty simple actually, but it can pay very well and that’s what makes this slot so interesting. The Wild symbol is shown as a flying orb type robot which is the joint most valuable symbol in the game. Furthermore, it will substitute for all other symbols in a winning combination. Wild-O-Tron 3000 Feature. This is the main, in fact, the only feature in this game and it’s a surprisingly simple one at that. At the beginning of every spin during the base game you have a chance to activate it. It will transform all occurrences of 1 up to 6 symbols during the spin into Wild symbols. The lamps on the machine next to the reel will light up with the colours of the associated robot symbols. And that’s that. No more features, no free spins so to speak. 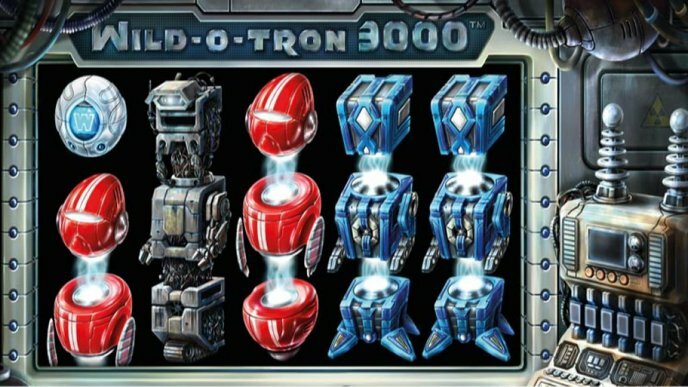 Can Wild-O-Tron 3000 slot from Netent really compete with others out there when it’s so simple? Well, yes. Netent are no strangers to making a successful slot and as one of the biggest companies in the gaming industry, they know how to do it. What they’ve got on offer here is a slot with a simple yet very effective feature that has the potential for some big wins when you can actually turn all the symbols on the screen into Wilds. It’s a simple concept, but I like it. The Wild symbol, and the other symbols for that matter, all pay out pretty well so wins can get pretty high. Don’t be put off by the simplicity of this game, be sure to give it a go and let us know what you think down in the comments below.